Manchester City missed the chance to make up ground in the Premier League title race as they were held to a goalless draw by a stubborn Everton. 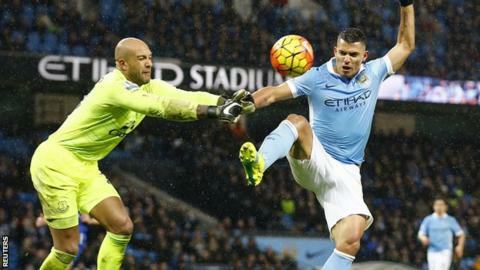 Manuel Pellegrini's side dominated the second half but were repeatedly denied by away keeper Tim Howard. It was a supreme defensive display from the Toffees, who had been the better attacking side in the first half. They also rode their luck, as City were denied a late penalty for a foul on Raheem Sterling by John Stones. For Everton, it is a point won - and a confidence-boosting one, following a run of seven games in which they have won just once. But it is two key points dropped for City and they remain three points behind joint league leaders Arsenal, held 3-3 by Liverpool, and Leicester, 1-0 winners at Tottenham. Listen: Is Pellegrini 'too nice' to win the title this season? Football Daily podcast - Does anyone want to win the league? The game began in a half-full Etihad Stadium as traffic problems prevented many fans arriving by kick-off. However, you would forgive many of the City supporters who did eventually make it to the ground for wishing they had not. Before the break, the home side looked sluggish and were outworked by a dynamic away side. They did produce a couple of chances - the best of them a Yaya Toure header from eight yards that was palmed away by Howard - but could easily have trailed. They improved in the second half as Sergio Aguero became more involved, but still struggled to break their opponents down, even after the introduction of David Silva with 15 minutes to go. The game would end in desperate, vain calls for a penalty for Stones' admittedly risky sliding challenge on Sterling. City boss Manuel Pellegrini was adamant that Stones' challenge should have been penalised and his side awarded a "clear penalty". "Everyone in the stadium could see it was a penalty - it was so near to the referee and so clear," said the Chilean. "Both Raheem's legs were taken by Stones but if he doesn't whistle we can't say anything." Unsurprisingly, Everton boss Roberto Martinez had an opposing view of the incident and praised the "maturity" of referee Roger East. "We have been on the back end of receiving a penalty, in the last seconds against Stoke," said the Spaniard. "Stones goes to slide to block the ball, Sterling does not play the ball and waited. In my eyes it is an area that is not certain if it's a penalty or not. "I believe the referees should control their emotions and the referee did exactly that. It is impossible to be 100% certain and I am pleased he did this and showed his maturity." "Man City were hard done by in the end. Sterling takes on Stones and halfway through the tackle Stones realises he can't get to the ball, but his momentum on the wet pitch means he slides in. There was contact - it should have been a penalty." This game was the second part of a fixture trilogy between these sides in January, falling between the two legs of a Capital One Cup semi-final. A week ago, Romelu Lukaku's winner gave Everton a 2-1 victory at Goodison Park, and they impressed again in a performance that showcased both sides of their game. In the first half, the Toffees were patient and precise when they had the ball and hard-working when they did not. But for some wayward shooting, they would have led at the break. Gerard Deulofeu and Lukaku were both denied with shots from an angle in the box, while the latter set up Leon Osman for the best chance - a volley from 15 yards that flew just past Joe Hart's far post. After the break, Roberto Martinez's side were firmly on the back foot and spent long spells without the ball but demonstrated discipline and commitment to limit City to only a few goalscoring chances. Manchester City are at home again on Saturday, with Crystal Palace the visitors. Everton face another tough away trip on the same day, as they travel to Stamford Bridge to face Chelsea. Match ends, Manchester City 0, Everton 0. Second Half ends, Manchester City 0, Everton 0. Attempt missed. Romelu Lukaku (Everton) header from the centre of the box misses to the right. Assisted by Muhamed Besic with a cross. Offside, Everton. Leighton Baines tries a through ball, but Arouna Koné is caught offside. Foul by Bacary Sagna (Manchester City). Steven Pienaar (Everton) wins a free kick on the left wing. Attempt blocked. Romelu Lukaku (Everton) left footed shot from the left side of the box is blocked. Assisted by Leighton Baines. Attempt missed. Sergio Agüero (Manchester City) right footed shot from a difficult angle on the right is just a bit too high. Assisted by David Silva. Attempt blocked. Jesús Navas (Manchester City) right footed shot from outside the box is blocked. Assisted by Yaya Touré. Corner, Manchester City. Conceded by Phil Jagielka. Attempt blocked. David Silva (Manchester City) left footed shot from outside the box is blocked. Assisted by Yaya Touré. Attempt blocked. Raheem Sterling (Manchester City) right footed shot from the left side of the box is blocked. Assisted by David Silva. Attempt missed. Jesús Navas (Manchester City) header from the centre of the box is high and wide to the left. Assisted by Gaël Clichy with a cross. Offside, Everton. Tim Howard tries a through ball, but Romelu Lukaku is caught offside. Substitution, Manchester City. David Silva replaces Kevin De Bruyne. Attempt missed. Kevin De Bruyne (Manchester City) right footed shot from outside the box is too high. Assisted by Fernando. Attempt blocked. Raheem Sterling (Manchester City) right footed shot from the left side of the box is blocked. Assisted by Kevin De Bruyne. Attempt blocked. Yaya Touré (Manchester City) right footed shot from outside the box is blocked. Assisted by Raheem Sterling. Substitution, Everton. Arouna Koné replaces Leon Osman. Substitution, Everton. Steven Pienaar replaces Gerard Deulofeu. Attempt saved. Sergio Agüero (Manchester City) right footed shot from the centre of the box is saved in the centre of the goal. Assisted by Yaya Touré with a through ball. Corner, Manchester City. Conceded by Ross Barkley. Attempt saved. Raheem Sterling (Manchester City) right footed shot from the right side of the box is saved in the centre of the goal. Assisted by Fernando. Attempt saved. Sergio Agüero (Manchester City) right footed shot from the centre of the box is saved in the centre of the goal. Assisted by Kevin De Bruyne with a cross. Corner, Manchester City. Conceded by Ramiro Funes Mori. Attempt blocked. Yaya Touré (Manchester City) right footed shot from a difficult angle on the right is blocked. Assisted by Kevin De Bruyne. Offside, Manchester City. Jesús Navas tries a through ball, but Sergio Agüero is caught offside. Attempt missed. Raheem Sterling (Manchester City) right footed shot from the left side of the box misses to the right. Attempt blocked. Jesús Navas (Manchester City) right footed shot from outside the box is blocked. Assisted by Martín Demichelis.